Over most of its vast range in the interior of the western US and Canada, the Spotted Towhee is a common and familiar bird of dry brushy habitats. Many populations occupy mountainous habitats that are relatively safe from human disturbance. In some areas, however, local populations are threatened, or have even been extirpated, by urbanization and agricultural development. It has been suggested that many residential areas, while creating favorable habitats, are actually reproductive “sinks,” attracting towhees to nest but at the same time exposing both adults and young to predation by free-ranging and feral housecats. In southern Mexico, human activities are thought to have altered habitats and thus towhee distributions over hundreds, perhaps even thousands of years. The continual creation of extensive areas of second-growth brush resulted in the “interdigitation” of Spotted and Collared Towhees and increased opportunities for hybridization and introgression between those species. As is usually the case, island populations of this species are less secure. The Guadalupe and Socorro Towhees are treated in separate accounts below. 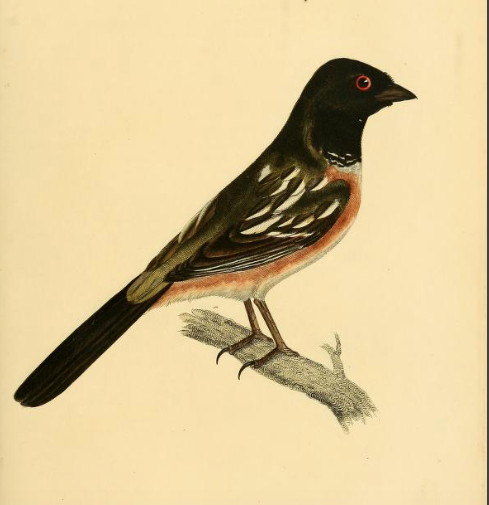 The San Clemente Towhee, Pipilo maculatus clementae, is thought to have declined greatly in numbers over the past century, and to be extirpated entirely from the eponymous island itself, persisting only on Santa Catalina and, possibly, Santa Rosa Islands (the Santa Rosa birds may be representatives instead of the mainland megalonyx, which also occupies Santa Cruz Island). Behavior:“A solitary and retired, but not a distrustful bird,” the Spotted Towhee spends much of its time on the ground, scratching vigorously for seeds or small invertebrates in the shade of the dense understory of oak woods in the north and high-elevation oak, pine, and fir forest in central and southern Mexico. Towhees are usually found as single birds or, in the breeding season, in pairs, though in migration and winter half a dozen birds can be encountered in loose but apparently amicable association. Most feeding takes place on the ground, but Spotted Towhees occasionally ascend into brambles and dense, leafy trees to take berries and other fruit. If startled, they immediately retreat into the darkest, thickest foliage, perching quietly just above the ground, sometimes for many minutes, before returning to forage. Like the Eastern Towhee and other large sparrows, the Spotted Towhee flies on fast, shallow, often quite audible wing beats, bursts of whirring activity punctuated with momentary glides as the bird moves from thicket to thicket. The long, conspicuously spotted tail is switched and wagged. Though nearly terrestrial most of the time, male Spotted Towhees often claim conspicuous perches to sing, usually stretching the head and neck and lowering and slightly flaring the tail. That hoarse, whining, scratchy call, given by both sexes in states of both calm and alarm, typically rises, then falls, slowing towards its end. Shared in similar form among all Spotted Towhee populations in Canada, the US, and northern Mexico, this call is apparently not given by the towhees of central and southern Mexico and Guatemala, which instead utter a clearer, consistently rising “ch-wee,” recalling the analogous notes of the Eastern Towhee. All populations also have a hissing, lisping “tzeet” call, less buzzy than the corresponding note of the Eastern Towhee; this vocalization “often occurs in social contexts involving mated pair”. As in the Eastern Towhee, the songs of the Spotted Towhee are rather variable. The usual pattern consists of a series of short separate notes followed by a faster, drier trill; the two parts are similar in tone and delivery, without the extravagant slurring and pitch changes of the Eastern Towhee’s song. Some songs, even within a single individual’s repertoire, are relatively leisurely, others so fast as to end in less a trill than a rattle or buzz. In the northern portion of the species’ range, inland birds tend to sing complete songs, while those on the Pacific Coast more frequently omit the introductory notes, reducing the song to a trill or buzz. Adult Pipilo maculatus arcticus: Tail feathers slaty-brown (female) or black with moderate gloss (male), outer three or four feathers with oblong white spot on inner vane, extending across entire feather on outermost rectrix. Upper tail coverts and feathers of rump gray-brown with paler buffy tips (female) or black with faintly olive edging (male). Back dark gray-brown (female) or brownish-black (male) with faint greenish tone. Scapulars dark brown (female) or blackish (male) with white spots and streaks. Primaries blackish-brown (female) or blackish (male) with short, narrow white or buff-white slash on outer web of four or five outer primaries. Secondaries blackish-brown (female) or blackish (male). Tertials dark brown to black, with conspicuous white or dull white stripe on outer web of outer two or all three feathers. Greater and median coverts brown to blackish-brown (female) or black (male) with neat white tips, forming two dotted wing bars. Marginal coverts of underwing white. Under tail coverts and vent pale dull buffy. Belly and lower breast clear white; breast sides and flanks pale to deep rufous-orange. Lower breast, throat, and head dark grayish-brown (female) to deep black (male); female’s crown sometimes faintly streaked, and lower edge of upper breast darker blackish. Bill black; stout tarsus and toes brown, dull pinkish brown, or blackish. Juvenile: Tail feathers brown to blackish-brown, outer three or four feathers with oblong white spot on inner vane, extending across entire width of feather on outermost rectrix. Upper tail coverts and rump yellowish-buff with faint darker spotting or streaking. Back and nape variably yellowish-buff to rusty brown with coarse blackish streaking. Primaries, secondaries, and tertials dull brown, darker in male, paler in female. Greater and median coverts with neat cinnamon or buffy tips creating low-contrast dotted wing bars. Undertail coverts dull buffy brown. Vent, belly, breast and throat yellowish or buffy, with blackish streaking heaviest across breast. Flanks and breast sides dull cinnamon with fine brown streaks and spots. Throat pale yellowish, separated by fine brown lateral stripe from poorly defined buffy jaw stripe. Crown and sides of head dull yellowish brown, the crown with fine streaks. Bill dark pinkish-brown, stout tarsus and toes dull gray-brown. At least north of Mexico, the preformative molt in this species—from juvenile to formative plumage—is less than complete. Many, but not all, birds in their first year of life can be aged in the field by contrasts between new, formative feathers and old, retained juvenile feathers in wing or tail. The iris color changes gradually from gray-yellow to deep red over the first six months of life, with some individuals still dull-eyed into their first spring. Adult Pipilo maculatus maculatus: Tail feathers dark sooty (female) or dull black (male), outer three or four feathers with large oblong white spot on inner vane; outer web of outermost rectrix also tipped and edged white, or sometimes almost entirely white. Upper tail coverts and feathers of rump olive-brown (female) or olive-black (male). Back olive-brown (female) or brownish-black (male) with green tone and black streaking. Scapulars dark olive-brown (female) or olive-black (male) with black shaft streaks and white edges. Primaries and secondaries blackish with green tinge. Tertials dull blackish, with variably conspicuous dull white stripe on outer web of outer two or all three feathers. Greater and median coverts blackish-brown (female) or black (male) with neat white tips, forming two dotted wing bars. Marginal coverts of underwing yellowish. Under tail coverts and vent tawny buff. Belly and lower breast clear white; breast sides and flanks rufous, sometimes with blackish spots or streaks. Lower breast, throat, and head dark sooty (female) to deep black (male); female’s crown usually streaked darker. Bill black; stout tarsus and toes dull pinkish brown. Juvenile: Tail feathers brown to blackish-brown, outer three or four feathers with oblong white spot on inner vane; outer web of outermost rectrix also tipped and edged white, or sometimes almost entirely white. Upper tail coverts and rump yellowish-brown with faint darker spotting or streaking. Back and nape variably yellowish-buff to brown with coarse blackish streaking. Primaries, secondaries, and tertials dull brown, darker in male, paler in female. Greater and median coverts with neat cinnamon or buffy tips creating low-contrast dotted wing bars. Undertail coverts dull buffy rust. Vent, belly, breast and throat yellowish or buffy, with blackish streaking heaviest across breast. Flanks and breast sides deep dull rust with heavy dusky streaking and spotting. Throat pale buffy with blackish streaks, separated by blackish lateral stripe from poorly defined brown jaw stripe. Crown and sides of head olive- brown, the crown with fine streaks. Bill dark pinkish-brown, stout tarsus and toes dull gray-pink.